Hope everyone is having a fabulous week thus far. To finish up our "Style It: Blogger Editions", last but certainly not least, today is all about Jo from personal styling blog White Roses and Coffee! We heart this blog because Jo is a real girl with an amazing sense of style! 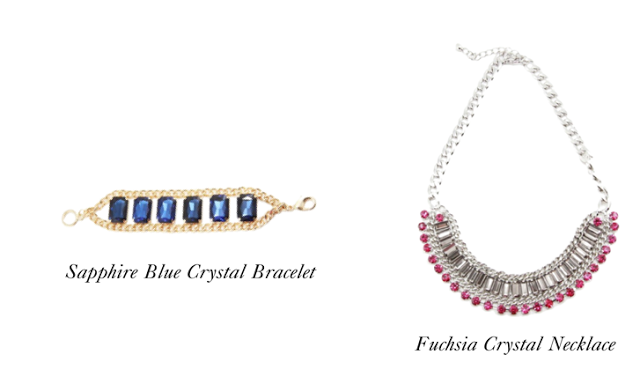 Jo, like the other bloggers featured in this styling contest, will be showing us how she would style the Sapphire Blue Crystal Bracelet and Fuchsia Crystal Necklace shown below! Jo switched things up and decided to show us how she would style both pieces together! Her mesh accent neckline LBD from Forever 21 was the perfect canvas for these sparkling jewels. We love that even her nails and lip color bring out the pretty pink hues in the necklace! How gorgeous does the Sapphire Blue Crystal Bracelet pop with a black backdrop? Jo also shows us how she would style the Fuchsia Crystal Necklace on it's own. All-white ensembles are going to be huge for the upcoming Spring season! Jo perfectly nails this on-trend outfit pairing crisp, tailored pieces with just a pop of color in the accessories. The pretty pink hue in the necklace was also found in her bracelet. Check it out here. We love her oversized neutral watch and gold rings. Overall this is such a classic and chic look, so easy but you end up looking so put together! What was your favorite look from Jo? Will you try an all-white ensemble this Spring? A special thanks to Jo for her fantastic styling! All 3 of the featured bloggers have done an amazing job giving us inspiration on how to style our pieces in unique ways! If you missed Lisa or Jen's styling posts check them out here & here. Make sure to stay tuned as one of these lovely ladies will be chosen as a winner! Thanks for the feature! You girls are the best! I'm so happy that you like my outfits. Fabulous feature! Jo dresses and accessorizes well. I love her blog. Fab jewelry! The all-white ensemble is such a classy look! It matches the pink necklace too, and really makes the gorgeous necklace stand out. Great style!!! I love Jo's style and how she paired the LBD with the fuschia necklace!